22/04/2015- The OECD and Ukraine today signed an Action Plan for strengthening co-operation to help tackle corruption, improve public governance and the rule of law, boost investment and foster a dynamic business environment. The Action Plan, signed during a visit to the OECD by Ukraine’s President Petro Poroshenko, deepens the collaboration between the OECD and Ukraine by setting concrete actions in those areas where OECD’s expertise can help Ukraine meet its policy challenges and advance its public reforms. The Action Plan includes a series of policy reviews and capacity building activities aimed at establishing a sustainable and effective reform process. 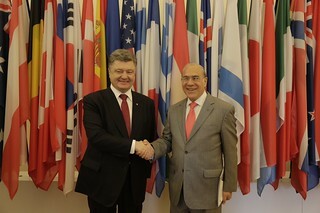 President Poroshenko and OECD Secretary-General Angel Gurría also held a brief bilateral meeting. 22 April 2015 - Petro Oleksiyovych Poroshenko, President of Ukraine and Angel Gurria, OECD Secretary-General. OECD, Paris, France. Mr. Gurría said: “The OECD has accompanied the economic transformation of many countries in Central and Eastern Europe. These countries are now thriving democracies and prosperous market economies. We look forward to partnering with Ukraine towards achieving the same goal.” (Read the speech). OECD reviews and recommendations to contribute to improved policy making. Adherence of Ukraine to selected and relevant OECD legal instruments in order to meet international standards. Ukraine’s participation in the work of relevant OECD bodies in accordance with applicable rules and practices to enhance international dialogue and knowledge sharing. Exchange of information and data. The Action Plan follows a Memorandum of Understanding to bolster the OECD’s relationship with Ukraine, signed on 7 October 2014. Further information on the OECD’s work with Ukraine is available here, or from the OECD’s Media Division (news.contact@oecd.org ; tel: +33 1 4524 9700).